The new organ for St Peter's is a three-manual instrument with 39 stops. In common with many English churches, finding a suitable position for the organ was not easy, and it was decided to place it in the same position as the organ it replaced, in the north aisle to the west of the chancel screen. The Great Organ is in the front of the case, with the Choir Organ behind it, the Swell Organ at the rear with the Pedal Organ either side. The organ employs mechanical action with electric stop action. In some respects, the position chosen for the organ, although inevitable, is not ideal. The instrument speaks across the church rather than down its length. To mitigate this to some extent, the casework has pierced elements, to enhance the egress of sound, and no roof. Also, the swell box has two swell fronts. One, operated mechanically, is in the usual position and a second swell front is set on the side of the swell box and can be switched in electrically for those occasions when more presence is required of the Swell Organ. 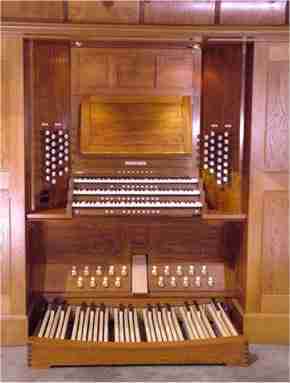 Modern organs are required to be far more versatile than organs of old which generally fitted into a particular style of organ music. Organists and listeners expect a wide variation of tone and repertoire to be played from all areas of the world as well as different eras. Clearly, it is not possible within the scope of one instrument to produce an authentic rendering of the vast organ repertoire but at least it should be musical. How can this be achieved? The aim is to scale and voice the organ so that an almost unlimited combination of sounds and registers can be selected by the organist to recreate the sounds required by the music as effectively as possible. To manage this, the various registers need to have a high degree of blend, and this has been our aim with the new organ for St Peter's. Acoustics play a crucial role in this, and the removal of carpet in the church has undoubtedly helped this cause greatly as well as enhancing the congregational singing, not to mention the effectiveness of the choir. Lack of space dictated that the Pedal Organ be kept relatively modest if there were to be three manual divisions. However, the inclusion of an Open Diapason 16 (which is of wood) together with a Quint 10 2/3 ensures a solid foundation to the organ. The instrument is well endowed with mutations, and of particular note is the unusual three-rank Cornet which is mounted in the front of the case. This can be combined with flutes and principals of 8 and 4 foot pitch in various combinations to produce a variety of Cornet tone. An organ should suit a building not only musically but also visually. It is generally a large piece of furniture and can dominate a building if its design is unsympathetic to the overall style of the church. Once again, here at St Peter's we have aimed to create a design that gives the appearance of having been in the church forever. Other notable elements of design in the church that are relevant are the screen and the pulpit, and both acted as inspiration for the design of the organ, in particular in the way the casework mouldings were treated and in the design of the carving. 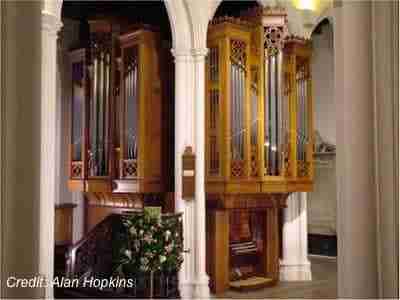 We hope that the organ will now give pleasure to many generations of the congregation at St Peter's and that it will also assume an important role in the bi-ennial International Organ Festival for which St Albans is so famous. 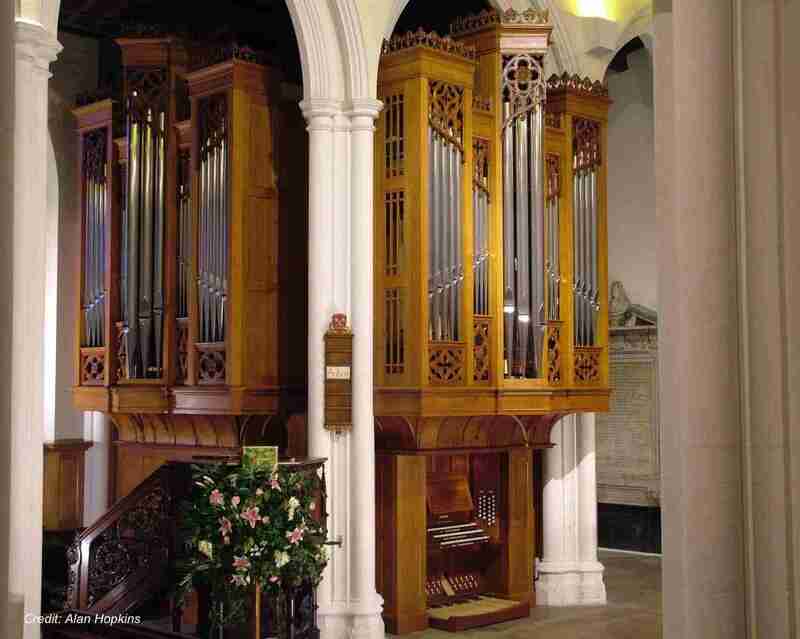 View the Specification of the organ in St Peter's Church, St Albans (completed 2006) and pipe scales.